It is astounding that all those years ago, Plato had it figured out. Constant thoughts circulate in our minds on a daily basis, but are we slaves to our minds? Are we constantly trying to drown out the noise? Do we try to hush our thoughts so we can carry on with our day-to day routines? Perhaps the healthier way to live is to think of our minds as an instrument that we can learn to master. At what age is it possible to learn to be the master of your own mind? As school teachers, we believe children can learn at a very young age to become familiar with their mind and how it thinks. 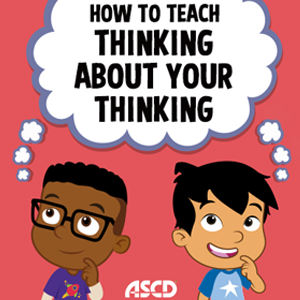 Even as young as preschool and kindergarten, students can begin to understand that we can think (and talk) about thinking. Metacognition is one of the most important of all the Habits of Mind. This habit is the one that lets you know how and when all of the other habits are working! But how do we teach children what metacognition means? Truthfully? It is not as hard as it seems. Vygotsky believed, “Children grow into the intellectual life around them”. As teachers, we believe it too. We have some tried and true recipes up our sleeves that have proven to be excellent ways to get children “thinking about their thinking”. At the beginning of each school year, we break out the good ‘ole lint brush! Why you ask? Well, because it’s time for our Schema lesson, of course! This lesson sets the stage for Metacognition for the entire year. For this lesson, the teacher writes on any thought he/she can think of on single pieces of paper. These may have only one word, such as, Pennsylvania, Fall, My dog, Buddy, Mcintosh apples. The teacher sprinkles these “thoughts” on the floor, like a snowstorm. Then comes…. the “schema roller” a.k.a. lint brush (we bought pretty hot pink chevron ones at the dollar store). The teacher talks about how your mind is like the lint brush- it holds all of your thoughts, feelings, memories...anything you think about or have experienced. Then she rolls the schema roller over all the thoughts on paper and as the thoughts stick to the schema roller, the children form a mental connection for what it means to have schema. Then, we ask “What is in your schema for...Disney World, friendship, lunchtime?” The kids are so excited to share their thoughts about every topic! This is a great activity to do at the beginning of the year. We refer to schema as “your mental filing cabinet”. We usually hang file folders on a bulletin board entitled “Our Schema” and each file folder has a title such as “Friendship”, “Summer”, “School”, etc. Students use Post-it notes to write things that are in their “schema” for each topic. We try to change the folders seasonally. This is a great way to create a visual representation of what happens in children’s minds when they are thinking and learning. It helps children become familiar with their mind and how it works. This lays the foundation for metacognition. we learn from reflecting on experience”. One of our favorite activities surrounding metacognition is to have students create a painted reflection piece that gives us a glimpse into their thinking and feeling. This could come on the heels of a large unit, such as “Deforestation”. It could also be used after studying a poem or a story, after viewing a piece of art, or even following a lesson in math. Using watercolors, students are tasked with using color, line, symbols, and shapes to create a painted reflection that shows their main “take-away” from the unit. After creating their piece, they explain it in writing such as, “I felt warm and happy when I read the poem, so I chose yellow like the sun”. ● When did you feel most successful this week? What made you feel that way? ● What challenged you this week? What strategies did you use to work on those challenges? ● Which Habits of Mind did you use when you were working on….? ● What is something you learned this week that you want to know more about? How can you do this? ● What goals can you set for yourself for next week? What might help you reach those goals? Reflecting on learning in this way allows students to deepen their connections to any given topic. The act of painting itself, coupled with quiet, classical music and journal writing sets the stage for a heightened awareness of what is going on in their minds...the essence of metacognition. At the same time, when they do an amazing job and find success, they can feel proud when they look in the mirror and tell themselves so! To continually reinforce and review these lessons, we love to visit WonderGrove Learn and so do our students! “Thinking About Your Thinking” from the Habits of Mind Animations is one of our favorites. This animated video poetically and thoughtfully shows exactly what it means to be metacognitive in a way that young children can understand. The Habits of Mind Animations teach students valuable critical thinking and problem-solving techniques by modeling what practicing each habit looks like. In today’s world, where “93% of employers cite critical thinking, communication, and problem-solving skills as more important than a candidate’s undergraduate major” (Wall Street Journal), we believe it is fair to note that teaching children to think about their thinking is not a “soft-skill”. It is indeed a life-skill that governs all of their learning, growing and becoming. Let’s do right by our students and teach them to be the master, not a slave, of the beautiful instrument called the mind. It will be a life-changing lesson. Laura Fitzpatrick has been an Early Childhood Educator in South Florida for 16 years. She is an avid blogger, presenter, and most recently, a published author of her first children’s book, “Words Glow…Minds Grow”, published tshrough The Institute for The Habits of Mind. Laura is passionate about weaving the Habits of Mind into her classroom and into her curriculum. Kathleen Malanowski has been an elementary educator and school administrator for over 25 years. She is passionate about teaching and learning and loves being a Lower School Principal. Kathleen works with teachers and students to develop a school-wide culture centered around thinking and learning through a collaborative and supportive school environment. Follow her on twitter at @NBPSLower.